"If a man devotes himself to art, much evil is avoided that happens otherwise if one is idle." It's fair to say that without Albrecht Dürer, printmaking as we know it within art history and contemporary art, would not exist. Despite living approximately 500 years ago, he remains one of the most famous and important printmakers in art history, in particular bringing woodcuts printed in large editions into the realm of fine art and the art history canon. Even though Albrecht Dürer's fame was largely built on his prints and graphic style, his financial income was secured with commissions of paintings of religious subjects and portraits, and these works remain held in high esteem for their draughtsmanship and use of color. He was, and remains, the most famous artist of the Northern Renaissance who successfully integrated an elaborately-detailed Northern style with Italian Renaissance's ideals of balance, coherence, and monumentality. Until the 1500s, the art of Renaissance Italy (focused on proportion, perspective and representations of 'man' in his environment) had remained almost entirely independent from late medieval art in the north of Europe (focused on naturalistic studies). Dürer combined these two modes of art making, and was the first non-Italian artist to apply contemporary philosophy, medical, and theological ideas to his paintings. Dürer felt it was important to produce artistic allegories for new conceptions of the human. For example, his famous series of prints, Knight, Death, and the Devil (1513), St. Jerome in His Study (1514), and Melencolia I (1514), represent the three spheres of human activity: the active, contemplative, and intellectual. Later in his life Dürer became increasingly engaged in scientific topics, publishing treatises including his Four Books on Measurement (1525), Treatise on Fortification (1527) and Four Books on Human Proportion (1528), for which he created illustrations. He believed that geometry was essential for producing harmonic artworks, and thus that it should be taught to all young artists, alongside other mathematical rigors. Despite his decidedly Renaissance interest in humanism and mathematics, Dürer continued to produce extremely detailed studies of the natural world, particularly animals - be they newly discovered in Europe (such as the mythical rhinoceros and lion) or common native creatures (such as the hare, owl, or cat). Dürer was well aware of his own artistic genius, which equally tortured and enlivened him. He painted a number of aggrandizing self-portraits, and would often appear as a character in his painted commissions. He was one of the first artist celebrities, with copycats, followers, and fans; in a model that continues to this day. Dürer was born in the city of Nuremberg on March 21st 1471 to Albrecht and Barbara Dürer as the third child of the two, who would go on to have at least 14, and possibly as many as 18 children. His father, a successful goldsmith, had moved to Nuremberg from Ajtós near Gyula in Hungary in 1455. He changed his surname from the Hungarian Ajtósi to its German translation Türer, meaning doormaker. Due to the local pronunciation, the family name eventually became established as Dürer. This is the third woodcut in Dürer's terrifying Apocalypse series, which contains altogether fifteen scenes from the Book of Revelations. It depicts the four Apocalyptic Riders as they are described in the Old Testament. From left to right we see Death, Famine, War and Plague on their horses, trampling on a group of helpless people. An angel oversees the scene, with dramatic clouds and rays of light in the background. In the Bible the three riders are mainly distinguished by their horses' colors. Dürer, having to make do with the black and white that the woodcut medium dictates, instead prominently depicts their weapons - bow, sword, a set of balances and a trident - as identifying attributes. Death is furthermore distinguishable as an old haggard man with a beard on an emaciated horse. The four figures are riding next to each other but are in slightly overlapping positions, denoting their order of appearance in the text. Death as the last to enter the scene brings with him Hell, depicted in the form of a wide-mouthed monster, who swallows a man wearing a bishop's miter and crown. The clergy and nobility are devastated by the Apocalypse just as the rest of society. Their contemporary clothing makes it easy for the 16th-century viewer to imagine their own suffering ahead. Apocalyptic scenes became particularly popular in the years leading up to 1500, which was predicted by many to be the time of the Second Coming of Christ. Dürer's Apocalypse series was published in 1498 as a collection of 15 folios, each verso showing the illustration and the recto containing a descriptive text in German or Latin. In 1511 the woodcuts also became available to purchase as single-sheet works. Today the prints still survive in large numbers, which indicates that they were produced on a big scale, probably to meet their increasing demand and popularity, and circulated widely. Dürer masterfully captures the panic and chaos of the end of times by filling almost the entire page with painstaking detail. The diagonal shape formed by the riders placed on top of the minutely thin horizontal lines that create the dark background gives the scene a sense of forward-thrusting dynamic. This work, as well as the accompanying illustrations of this series, shows the artist's unrivalled ability to achieve in the so often crude unwieldy woodcut medium the same kind of fine dynamism and depth of expression as in a drawing. This painting of the artist as Christ could be considered an audacious, blasphemous statement, but is most likely an expression of faith alongside a confidence in the artist's competency as creator. 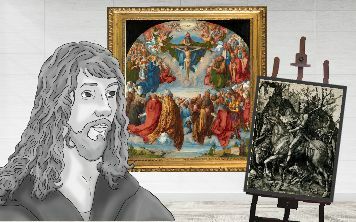 It shows Albrecht Dürer the artist, his talents bestowed onto him by God. Set against a plain background, the artist is directly facing the viewer. His right hand is lifted to his chest with two fingers spread apart, reminiscent of a gesture of blessing. His curly hair falls to his shoulders and his monogram is emblazoned prominently to his right. To his left stands an inscription in Latin that translates as "Thus I, Albrecht Dürer from Nuremberg, painted myself with enduring colors at the age of 28 years." During the Renaissance era the convention for portraits was to show the sitter in three-quarter view, mostly set within a realistic background. By choosing a frontal view and a dark non-descript backdrop, Dürer evokes religious images of the Middle Ages, especially devotional images of Christ Pantokrator. 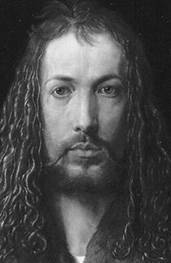 With his blessing gesture, long dark brown hair (Dürer was dark blond) and idealized features, the artist here clearly depicts himself as Christ. And given the Apocalyptic year of the work, the painting would therefore have been a strong expression of the artist's self-awareness as a devout Christian. Dürer was highly concerned with his public image, repeatedly inserting self-portraits into his works. The self-portrait from 1500 was sold or given by Dürer to the City Council of Nuremberg where it was on public display until the early 19th century. The incredible detail and care in this study of a small wild animal is a predecessor to the detailed scientific illustrations it has influenced and endures as an extremely accurate and sensitive depiction of one of nature's common creatures. It shows a hare in three-quarter view, its hind legs folded underneath its body, with the front legs slightly extended forwards. Although the work usually bears the title Young Hare, the animal can be identified as a mature wild hare. Dürer's nature pieces are famously detailed. Young Hare is, however, not simply a scientific study of an animal. The work contains an innate tension, created by the contrast between the subject and its depiction: a hare is a notoriously restless animal, fleeing when approached too closely. The artist has captured the hare in a fleeting moment of stillness. The slight turn of its ear and the eye that's fixing the viewer, however, indicate that the animal has noticed us. Its hind legs are bent, ready to jump. Whether the artist sketched a hare in the wild and completed the final piece with a dead specimen, or he kept a live animal in his studio is a question yet to be solved. The left eye reflects what seems to be a window. This has been taken as a clue that Dürer kept and painted the hare indoors. Adding a crossbar to the pupil of an eye is a recurring feature of Dürer's work and could simply be a technical method to create vitality in the eye. It could also be another testament to Dürer's meticulous attention to detail, of him capturing the reflection of his workshop window in his subject's eye. The prominent monogram and date indicate that the artist perceived the drawing as a complete work in its own right rather than a sketch. Dürer's depiction of 'the fall', the moment in Christian mythology where the first two humans - Adam and Eve - disobeyed God and ate from the Tree of Knowledge, remains unique in its bold depiction of 'man' and of nature. This engraving was made shortly after the young artist returned from Italy, and is more about his own interest in the Renaissance, combined with a pride in his own home, than the story in the book of Genesis. In Adam and Eve (the Fall of Man) the figures are based on classical nudes, and the ideal human proportions and poses as proposed by Greco-Roman artists and architects of the time. The wild foliage behind the couple bears resemblance to German forests, which the artist would have been familiar with and thus he literally places Italian figures within his local environment. Adam holds a small branch with a sign hanging from it, which boldly proclaims the artist's name - written as '"Albert Dürer of Nuremberg" (reinforcing his German pride) in Latin (the classical language). A parrot is perched on the end of the branch. The sound that parrots make was then interpreted as 'Ave Maria', and thus the birds were symbols of the Holy Virgin Mary, who is signified here as the woman who later compensates for Eve's original sin in Catholicism. As well as the snake, which is literally the devil according to the Bible, each animal has a particular symbolism. The rabbit, cat, and elk, represent the four 'humors'. According to Ancient Greek and Roman doctors and philosophers, there are four distinct bodily fluids in each person, and that an excess or deficiency in any one of these humors directly correlates with personality and health. In Dürer's Garden of Eden, the elk represents black bile, and a melancholic personality; the ox phlegm and a phlegmatic one; the rabbit blood and sanguinity, and the cat yellow bile, and the choleric. Again, the artist ironically uses the Biblical story of the fall of 'man', the failure and expulsion, to illustrate human beings' scientific and philosophical successes and ideals. Dürer's visit to Venice in 1506 culminated in the creation of the Feast of the Rosary, one of his most significant large-scale paintings. It shows the Virgin Mary surrounded by a large group of male figures and putti. She is being crowned with a wreath of roses by two cherubim whilst holding the Christ child on her lap. Saint Dominic stands to her right and two figures, thought to be Pope Julius II and Emperor Maximilian I, kneel at the front. Several more figures surround the throne. They are mostly believed to be members of the German community in Venice. Among them is Dürer himself, who is shown holding a piece of paper that reads EXEQUIT CUINQUE MESTRI SPATIO ALBERTUS DURER GERMANUS MDVI (It took five months Albrecht Dürer the German 1506). The Feast of the Rosary is one of the most impressive results of the cultural relations between sixteenth-century Venice and the artistic centers north of the Alps. It skillfully combines characteristics of Northern-European art such as the highly detailed composition and the landscape in the background, with Venetian elements like the Sacra Conversazione motif and musical angels, which can be found in works by Giovanni Bellini such as his San Zaccaria Altarpiece (1505). Dürer used distinctly Venetian pigments in this work, including large quantities of lapis lazuli. North of the Alps azurite was much more commonly used and Dürer never used lapis in any of his Nuremberg works. By combining materials, techniques and pictorial elements from both Northern and Italian schools of painting, fusing the Venetian obsession with color and light with the German conventions of a religious altarpiece, he successfully bridges the gap between both Northern and Italian schools of painting. Commissioned by a group of German merchants for the church of San Bartolomeo in Rialto, the presence of Venetian elements in a German-made artwork takes on more significance as it let patrons show their loyalty to the state of Venice while at the same time expressing their patriotism. Dürer's own interest to surpass his Venetian contemporaries by adopting their methods, skills, and qualities and taking them to a higher level, certainly played a big role as well. Being an established artist in his home, but having not quite found the same fame in Italy, he strove to prove his value to the Italian market. He himself was clearly satisfied with his work, writing to Pirckheimer that he had "silenced all those painters, who had said, I was good at engraving but at painting did not know how to handle colors." Praying Hands is likely one of the world's most reproduced images, and has become an international symbol for piety and for Christianity, up until and including the present day. Using printing technologies Dürer could never have dreamed of when he made this drawing more than 500 years ago, the image has appeared on bibles, t. shirts, needlepoint, and even on Andy Warhol's tombstone. This sketch is made with ink and pencil on blue paper that the artist made himself and was produced not as a standalone work, but merely a preliminary drawing towards an altarpiece commissioned by Jacob Heller in 1507. The altarpiece depicted the coronation of the Virgin Mary for a church in Frankfurt. These hands are drawn towards those of an apostle kneeling next to Mary's tomb. The altarpiece was destroyed in a fire in 1729, although Jobst Harrich made a close copy in the 1600s, which is on display in Albertina Museum in Vienna. Around the 1930s, a fable arose about the hands in this sketch, postulating that they were the hands of the artist's brother, worn from hard work and immortalized in this drawing. However, it is much more likely that the artist modeled the drawing on his own hands, and similar hands can be seen throughout his oeuvre. These floating, praying hands are extremely significant in the history of religious symbolism and remain so popular due to the way they might belong to almost anyone - with the rough shirtsleeves suggesting a worker or everyday man, as opposed to an important priest or scholar. Even though the artist did not intend for this to be a standalone work of art, it is an excellent and enduring example of the combination of theological, humanist, and naturalistic interests in Dürer's work. This print is a very early depiction of melancholia, or depression, is an integral image both in the production of the myth of the "suffering artist" and in the progression of artists depictions of their own mental health and anguish. Melencolia I forms part of a group of three plates called Meisterstiche (Master Engravings) from 1514, the other two titled St. Jerome in His Study and Knight, Death and the Devil. In this composition, a winged female figure is deep in contemplation, absent-mindedly holding a compass in her right hand. She wears a wreath and is surrounded by numerous objects, all of which have a particular symbolic meaning. A sad-looking putto sits behind her; an emaciated dog rests by her feet. A flying bat in the sky holds up a banner that states the title. Melencolia I is an archaic spelling of Melancholia, or profound and unnatural sadness. Art historian Erwin Panofsky famously described this work as Dürer's "spiritual self-portrait", a reflection of the artist's own melancholia or depression. In the Renaissance, melancholy was also believed to be closely linked to creative genius. The many objects depicted in the engraving underpin the notion that they were employed by Dürer to express his own artistic state of mind. The carelessly scattered and unused tools symbolize geometry, one of the seven liberal arts and likely the most significant to Dürer as an engraver, and the failure to utilize them. The hourglass, a well-known symbol for the transience of life, the ladder with no clear beginning or end, and the empty scales speak of apathy and aimlessness. The polyhedron seems to play on the famous Renaissance artistic concept of linear perspective, throwing it into confusion. Both the personification of Melancholia and the putto have wings, but are firmly grounded on earth, their thoughts too heavy to let them fly. Even the dog seems too thin and weak to get up. The image radiates defeat and paralysis, chaos and helplessness. The obvious skill with which this engraving was executed, however, stands in sharp contrast to the artistic ineptitude the painting symbolizes and this work established Dürer as one of the greatest engravers of his time. The rhinoceros depicted in the work was a gift from Sultan Muzafar II of Gujarat to the governor of Portuguese India. The latter sent it to King Manuel I in Lisbon, who in turn gifted in to Pope Leo X in Rome. The animal was loaded onto a ship but, after a brief stop at Marseille where it was admired by King Francis I of France, the rhinoceros drowned when the ship sank in a storm. Dürer never got the chance to see the animal himself. Its appearance was only available to him through written accounts and it is no surprise that Dürer's work does not show a realistic representation of a rhinoceros. The animal is shown with thick plates that resemble a suit of armor. The surface is covered in a pattern of circular marks. In addition to the horn on its nose, there is a second horn between its shoulders. Its legs are scaly, almost like that of a reptile. As the first rhinoceros to arrive in Europe alive since the third century ACE, the emergence of this almost mythical creature was seen in the context of the Renaissance as part of a rediscovery of antiquity and roused huge interest. Dürer's woodcut depiction of the animal became popular throughout Europe. Choosing the woodcut technique over the more laborious and cost-intensive copper engraving allowed for a quicker and easier reproduction. The first version of the print from 1515 was followed by altogether eight editions over the following three centuries. Later editions include an extended text. The image was repeatedly included in scientific texts. It also inspired subsequent artworks, from a panel in the west doors of Pisa Cathedral to Jean Goujon's obelisk outside the Church of the Sepulchre in Paris (1549) and Salvador Dalí's sculpture Rinoceronte vestido con puntillasvon (1956). In this oil painting of 1519 the emperor Maximilian I is shown in half-length and three-quarter view in front of a green background. He is turned towards his right and in his left hand he holds a pomegranate, a symbol of abundance as well as of his empire, with the seeds representing his subjects. The emperor is clothed in a fur-trimmed robe with a black dress underneath. His black hat is wide-brimmed and adorned with a brooch. The coat of arms of the Habsburg family together with the symbol of the Order of the Golden Fleece is depicted in the upper left corner of the painting. An inscription in capital letters above the emperor relates his titles and virtues. The Habsburg Emperor Maximilian I, whom he met in 1512 during a royal visit to Nuremberg, was among his most prestigious patrons. In 1518 Maximilian visited the imperial city of Augsburg where it is believed that the influential banker Jacob Fugger the Elder commissioned Dürer to paint the emperor's portrait. Before executing the work in oil, he sketched a pencil drawing, now in the Albertina in Vienna, annotating it: "Is the emperor Maximilian that I Albrecht Dürer portrayed in Augsburg, up in the high palace, in his small room, Monday 28 June 1518". Maximilian I made no secret of the fact that he used artistic commissions as a tool for self-promotion. He was highly concerned with his image as a ruler and the commemoration of his life and achievements. In Dürer's portrait the emperor is shown in expensive dress, the heavy fur collar of his robe taking up a large part of the picture. His grey hair denotes his age and wisdom and the pomegranate lies heavy in his hand, reminding the viewer of his responsibility as a ruler. The expression on his face is stern and determined. Rather than having the chain of the Order of the Golden Fleece displayed around his neck, as was usually custom, the fleece is dangling off his family's coat of arms, engraining the status further into his lineage. It has to be kept in mind that the portrait was painted after the emperor's death. The work, therefore, became one of the final pieces in Maximilian's series of artistic propaganda. Dürer subsequently adapted the painting into a woodcut, which would have been widely circulated and was eventually accepted as the best-known portrait of the emperor.